all winter, good numbers of Rainbows throughout, and a few Browns below the Upper Bridge. BWO’s are occasionally hatching, especially on cloudy days. Pheasant Tails, Sowbugs and Caddis nymphs have caught the most fish. When the BWO’s are hatching, parachute patterns and Emergers in size 18 or 20 get the most attention. Lost Creek and Evening Hole- Trout populations have fully recovered from last Spring’s flood. Size 22 Cream Midges and Size 20 BWO’s are hatching almost everyday, with an occasional PMD and Black Caddis hatch mixed in. If no hatch is present, Zebra Midges and soft hackles are working. Zone 2- Trout have been chasing shad most days. Small white or silver streamers stripped quickly are the choice when you see this. March Browns are beginning to hatch and will get more frequent as February progresses. March Browns will also begin to show up in Zone 1 and 3 as the hatch reaches its peak. Size 12 and 14 March Brown and Pheasant Tail dries, nymphs and soft hackles are the best flies. Small tan Caddis have been hatching some days. Zone 3- Generation has been frequent enough to make fishing impossible on the days I have been there, but it should be following the same trends as Zone 2. Consistent dry fly action and low crowds make February my favorite month on the Mountain Fork. 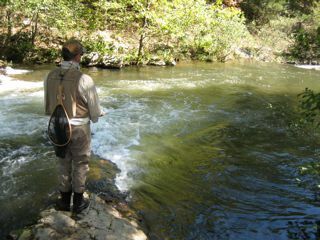 The annual Lower Mountain Fork River Foundation One Fly Fundraiser will be February 28, 2009. Details and registration info are at LMFRFoundation.org. The LMFRF Annual Meeting will be held that evening. Lake Fork- The Spring spawn will be here soon. The lake is full of both water and Hydrilla, and both bode well for great springtime bass fishing. March, April and May dates are filling fast. Keep in mind that the third or fourth day of a warming trend in February will move some big bass into the shallows. This is the time of year to throw big flies and work them slowly because the large females are looking for the biggest meal with the least effort. Bunny leeches, Bream patterns and Shad imitations are good choices. Good thing Chris has an enviable day job in the mortgage business. [/ppw]The last time I was in the New Braunfels area, there were few signs the economy was taking a breather, slowing or stopping. « TIP – Do You Ever Get That Sinking Feeling in the Bottom of Your Waders?